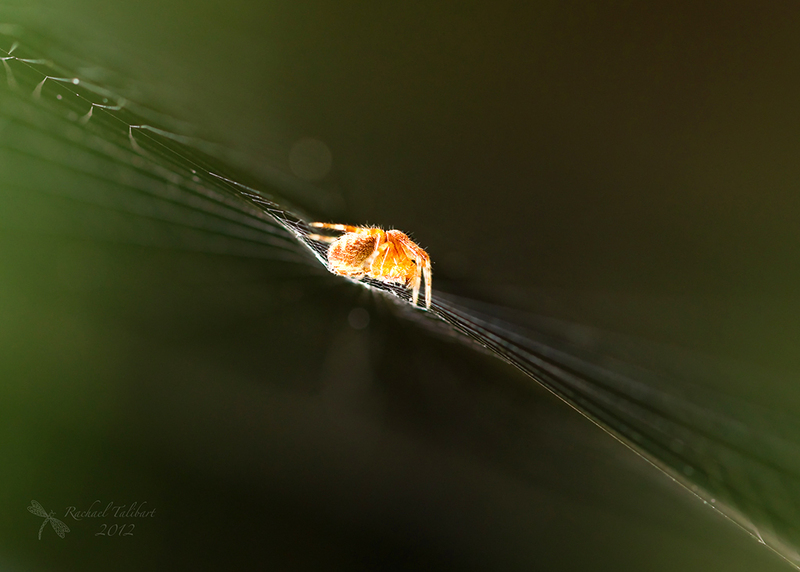 A beautiful little spider sits in the middle of its web. This entry was posted in garden, nature, photography and tagged garden, macro, nature, orange, photograph, photography, spider, spider's web, web by Rachael. Bookmark the permalink. That is a fantastic shot! You can almost sense its anticipation. Thanks. I can cope with spiders like this, about the size of a ladybird. Rachael, What a fantastic photograph with its eye catching subject and composition. I like the way the colours of the spider glow against the dark green background. It is so unusual seeing a web photographed from such an angle. I have been viewing the images on your Red Bubble site and appreciated your macro images of more small creatures. The photograph of the bug on top of the leaf gingerly looking over the edge to the hairy caterpillar underneath the leaf is priceless. Thank you very much, Margaret. Yes, that is one of my favourite macro shots. I spotted the shield bug first, behaving strangely, and it wasn’t until I reviewed my first test shot that I saw why!